Though his best known and most influential film is 1931’s Dracula (starring Bela Lugosi) and his most notorious film is the following year’s Freaks, circus performer-turned-filmmaker Tod Browning’s best film (well, best studio film anyway) might be 1936’s deranged cross-dressing mad-science revenge tale The Devil-Doll (aka in some markets, The Witch of Timbuctoo). This writer was first turned on to The Devil-Doll 8 years ago when, while in my early 30’s just starting freelancing for Fangoria, I ended up interviewing Canadian avant garde/expressionist filmmaker Guy Maddin (Careful, The Saddest Music in the World) in his Yorkville hotel room. We talked at length about his strange, unique and very personal body of work and how much of his aesthetic sensibilities were forged from watching plenty of silent and early 30’s horror and fantasy films. At the top of his list of influences sat The Devil-Doll. As I was ignorant to it, Maddin excitedly filled me in, citing how out of step and weird it was with the times and how it was indeed a better film than Freaks; that Freaks was a singular experience, but that The Devil-Doll managed to take the eccentricities and surrealism of that picture and expertly shoehorn it into the body of a what appeared to be a conventional bit of fantastique cinema. And of course, Maddin was right. And when I did catch up to it some months later, with the work and words of Maddin in mind, I fell instantly in awe with the picture. The Devil-Doll is based on the novel Burn Witch Burn! 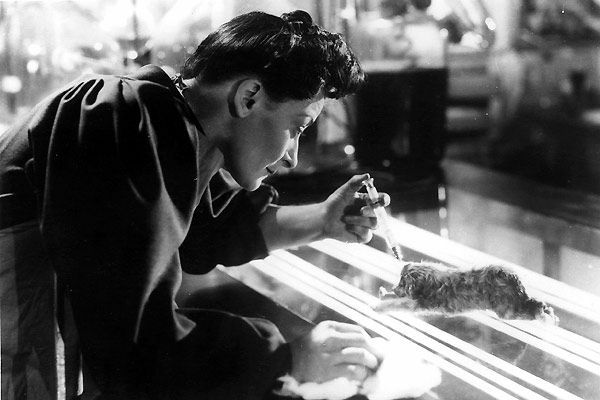 (nothing to do with the same-named British film that also goes under the title Night of the Eagle) by Abraham Merritt and was adapted for the screen by – of all people – maverick filmmaker Erich von Stroheim, who later appeared in Sunset Boulevard and Guy Endore, the popular screenwriter and author who wrote the novel The Werewolf of Paris on which Hammer’s 1961 classic The Curse of the Werewolf is based. Already, such astonishing pedigree for what was really just a quickie MGM picture. In fact, the studio let Browning make The Devil-Doll because they had to honor the contract they regretfully locked with him post-Dracula, in which Freaks was the first. Famously, Freaks was a bomb, reviled by mainstream audiences and banned in many countries; a HUGE loss for MGM and a blow to the head for then-golden boy Browning. 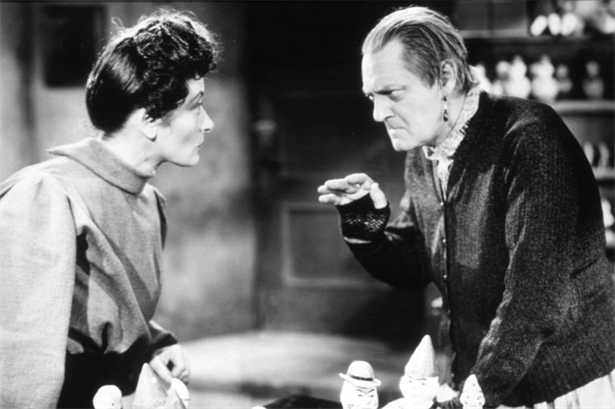 The film stars Lionel Barrymore as fugitive Paul Lavond, a Paris banker framed for embezzlement and murder who escapes from an island prison with a kindly scientist to the doctor’s country cottage/secret lab. There he discovers the slightly mad medico has found a way to shrink dogs to fit in the palm of your hand, part of a daft scheme to shrink the world’s populace so that there will be more than enough food to go ’round. And, as he demonstrates on his poor, “touched” housekeeper, the trick works on humans too. Problem is, he has yet to figure out how to preserve brain function and his mini “devil-dolls” can only movie under the hypnotic control of whoever shrinks them. When the scientist dies of a heart attack, his wild-eyed assistant Malita (Rafaela Ottiano, who is magnificent) urges Paul to continue her master’s work. The unfairly convicted con considers this and comes to the conclusion that it’s a good idea, that he can somehow use this berserk new technology to get revenge on his ex-partners who sent him to rot. The duo pack up their bubbling beakers and frothing cauldrons and head to Paris, where Paul ends up dressing up in drag as a kindly old toymaker running a soon-to-be-opened shop in the city. 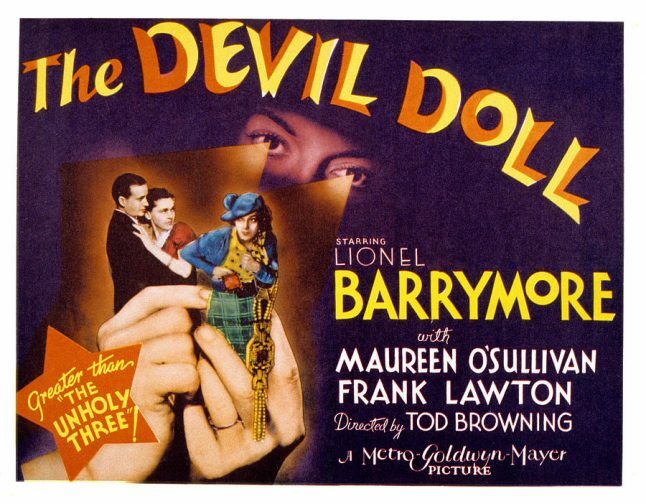 It’s here when The Devil-Doll starts to really channel the kink that Browning had famously employed since his days making twisted silent melodramas with the great Lon Chaney. Watching the amazing Barrymore hunched over in drag, effectively playing an elderly woman, walking right past the policemen who are combing the city looking for “her” alter ego is grand, lurid fun. Equally fun is watching him/her infiltrate the homes and lives of his now paranoid ex-partners, convincing them to either come to her shop or buy one of her dolls. They buy it. We don’t and that’s what makes it so weird and appealing. But, as in all of Browning’s personal films (though his most recognized work, in Dracula he was really just a hired gun) The Devil-Doll is propelled not just by fevered narrative devices and performances, but by a sort of melancholy, a broken heart. 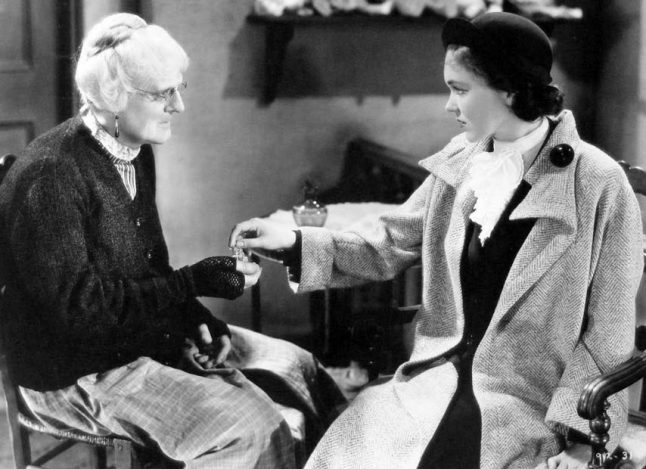 Here, the central thrust of the movie comes from the relationship he has with his long-estranged daughter Lorraine (played wonderfully by the beautiful Maureen O’Sullivan). Lorraine lives in poverty, working two jobs and caring for Paul’s ailing and now blind mother, her grandmother. Lorraine’s mother had long ago committed suicide after her husband’s shame and their ensuing financial ruin and she loathes the memory of her father for putting her in such a position and effectively ruining any chance of her having a happy life. In disguise as his female alter-ego, Paul visits Lorraine daily at the laundromat where she works, speaking kindly to her and bringing her gifts. Barrymore plays these scenes beautifully, his eyes filling with tears he can barely hold back as he stares at the child that misguidedly hates him to his core. And O’Sullivan matches him, occasionally stopping to look, to really look at the old woman and marvel at the surge of emotion she inexplicably feels, the sadness and pity that she cannot begin to articulate. It’s an absolutely beautiful, touching character connection and its wonderfully brought to life by those behind and in front of the scenes. And the special effects here are – for their time – remarkable. There’s a nod or three to The Bride of Frankenstein here too, with the mini “Devil-Dolls” looking like the “pets” that Dr. Pretorious invents in the masterful 1935 James Whale classic. The score for the film is also by Bride‘s Franz Waxman and even Malita’s hair and physical presence recalls the persona of Elsa Lanchester’s Bride herself. When Paul sets his toys forth to attack their intended victims, matte work and massive sets are employed and expertly blended together. You really do believe that small people are running around a very big world and doing their master’s bidding. Browning would make another film for MGM, 1939’s Miracles for Sale. It would be his last film. Disenfranchised with Hollywood and in the thralls of alcohol abuse, Browning took his money and ran, retiring from public life and living out his days in relative solitude until his death from cancer in 1962. His was a remarkable body of strange, beautiful and historically important work. And high on that list is the wonderful The Devil-Doll. Won’t you make some time for it?